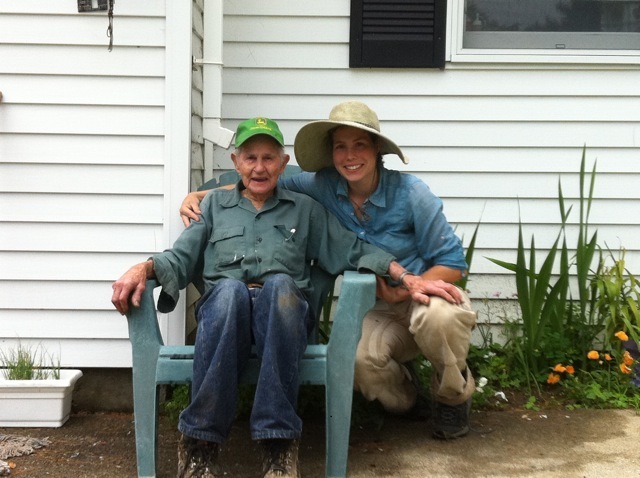 I have just received word that Francis Fenton, the “Apple Man” of Mercer, Maine, has died. We fought about chemical use in the orchard, his argument was that it made things easy and why would anyone ever want to go back to doing hard work? He lived in a time where he watched his father work himself to the bone because without technology, there was no other option. He would make a point to show me the chain which was once wrapped around a huge rock under the barn as a reminder that the team of horses (or oxen?) couldn’t pull that one out no matter how hard they tried. After our chemical discussions, he’d say: “Oh Liza, I love technology. I’m a technological guy! I’m open to new ideas.” And then he’d ask me why I didn’t become a nurse or work at Olive Garden…you know, to get a job with benefits. He couldn’t fathom any young person wanting to go into apples and continually tried to dissuade me. He was an original fruit explorer, exploring Western Maine for old apple varieties and bringing them back to his orchard. He had around 120 varieties and his favorite was the Wealthy, which he would eat as apple sauce with ice cream on top nearly every day. His wife, who died years ago, loved Mollie’s Delicious. He always told her the name of the apple was “Dollie’s Delicious” (he pronounced it “DollieLicious”)because her name was Dollie and it was close enough. She couldn’t eat acidic foods and that apple was alright for her, he said. I have hundreds of stories about Francis and apples that I’ll forever cherish. I’m blessed to have had him in my life and I hope he’s somewhere eating an apple out of hand. He’d often complain to me about how his dentures wouldn’t allow for such activities. Edit: This is part of an email I wrote back in 2012 about my experience with Francis. On the orchard, things are interesting. It’s actually a mixture of nightmare and fairy tale, if those two could ever be combined. The orchard is 5 acres, 120 varieties, and each variety is peppered throughout without any rhyme or reason. So, this means that I have to go out with a map every weekend, document the bloom time, and try to figure out spraying. Our first apple, the charette, bloomed 2 weeks ago while 15 varieties still haven’t shown any signs of flowering. Because we’re selling apples to the public, we have been spraying fungicide weekly to kill apple scab. It’s not what I want to do, but it’s Francis’ wish so we’re doing it. I’d much rather enter into a life-long battle of trying to change people’s apple shopping habits than spray. The fairy-tale portion of this is actually working with Francis. While living with him, I’m learning a lot about a nearly lost way of life. Since 1770, 3 generations of Fentons have lived on the property, Francis is the 3rd generation. He knew his Grandfather, who fought in the civil war and he still has sleighs that the family used to get around in the winter time. When walking through the forest, there are huge wolf trees- evidence of once farmed fields. He knows every wild thing growing on the property and we often enjoy meals of seasonal wild edibles. The past 3 weeks have been fiddleheads, or juvenile ostrich fern. There’s also dandelion greens and a few trout lillies here and there (eat the small bulb, it tastes very much like a sweet cucumber). So, we’re a good duo these days. He’s really excited that a 28 year-old female is living in his house (EVERYONE knows who I am because he announced it at church) and I’m excited about getting to know him. Chemicals or not, I’m learning a lot on the management side of things when it comes to relatively unknown heirloom apple varieties. Oh, Eliza. I’m sorry for your loss. Francis sounds like a gem of a guy and you are so lucky to have had the time with him that you had. I loved reading this piece. Hope you are well. I’m from Smithfield and I have fond memories of Mr. Fenton and to get apples with my family all throughout my childhood. So sad to hear of his passing. Eliza, what a great write-up in tribute to your friend. He sounds like he was an amazing, vivacious person filled with knowledge. We all enjoyed reading this at USApple.